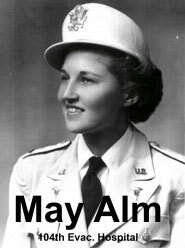 Edith Shain, the famous Times Square Nurse, whose energy and commitment to creating a national day to honor the WWII generation inspired people all over America, wasn’t the only woman to have made a contribution to the war effort. 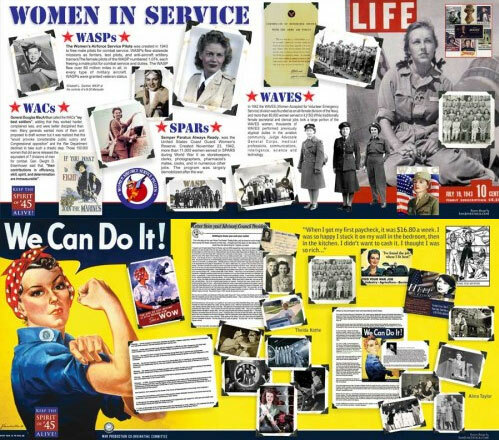 We’re pleased to see how many communities are celebrating the wartime contributions of American women with various displays and exhibits, oral history programs and other activities. HAPPY BIRTHDAY, RHONDA FLEMING! 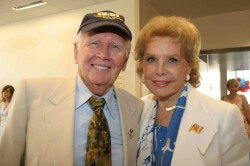 Rhonda Fleming and her husband, Darol Carlson, a WWII Navy veteran. After Edith passed away on June 20, 2010, several famous women who had done their part on the Home Front during WWII, stepped forward to assure that her efforts to inspire America with Spirit of ’45 Day were not in vain. A strong supporter of Spirit of ’45, Rhonda Fleming and her husband, Darol Carlson, a WWII Navy veteran, helped bring some star power to the 2010 National Spirit of ’45 Day event at the California State Veterans Home in West Los Angeles. They were joined by Broadway icon Carol Channing and her husband, Harry, also a WWII veteran (Army) , and Academy Award winning actress Margaret O’Brien to share their memories of what they did to support the war effort and what it felt like to be an American on August 14, 1945. 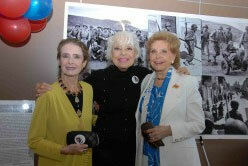 Margaret O'Brien, Carol Channing, and Rhonda Fleming May Alm, mother of Spirit of '45 webmaster, Marie Alm, served during the Battle of the Bulge, as an Army Nurse. Thousands of women served in uniform as WACs, WASPs, WAVES, SPARs, or “BAMies” (aka “Beautiful American Marines”), and millions more went into the factories and offices of the “Arsenal of Democracy” to fill the jobs left behind by the men who went off to war. Edith and Ernie at 2009 Memorial Day wreath laying ceremony in Washington, D.C. Wives and sweethearts, mothers, sisters, aunts and daughters wrote letters to their men to help keep their spirits up as they served their country far from their families and friends. And when the war ended on August 14, 1945, the women were there to welcome their heroes home and to start families together (in 1946, the first year of the “Baby Boom,” new births in the U.S. shot up to 3.47 million!) and begin to build a better future for themselves, their children and their children’s children. The posters on this page were created by Kym Brady for the 2-day Spirit of ’45 Weekend Event at History San Jose, the community museum that hosted Edith Shain in August 2007 when she first suggested the idea of an annual national day of remembrance to honor the men and women of her generation. 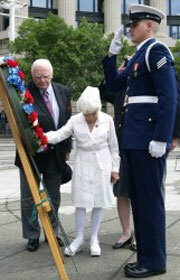 Kym traveled with Edith to Washington, DC 2009, the year she and Mr. Ernest Borgnine represented the Spirit of ’45 campaign inthe National Memorial Day Parade.